First things first, you need to create a project for a domain you want to perform a site audit on. Go to List of Projects(1) and click on Add New Project(2). Enter a domain name and a project name. If you already have a project created for the target domain, you'll need just to click Start Audit(3) on the project dashboard to launch the audit. For details on the site audit findings, go to Site Audit > Audit Summary. The first thing you’ll see here is a concise report with visual elements that displays the number of found errors from three categories: high, middle priority, and low priority errors. The Information category presents data that is not necessarily errors - for example, pages with a canonical tag. All errors from a particular category can be accessed by clicking the corresponding figure. On the left, Serpstat presents findings of the last audit; on the right - the previous audit results (if you did any previously). Serpstat checks for viruses on the website as well - the data is taken from Google Safe Browser. The report can be exported in PDF or XLSX. You can compare the site audit results with the previous audit by selecting the necessary audit from the dropdown. 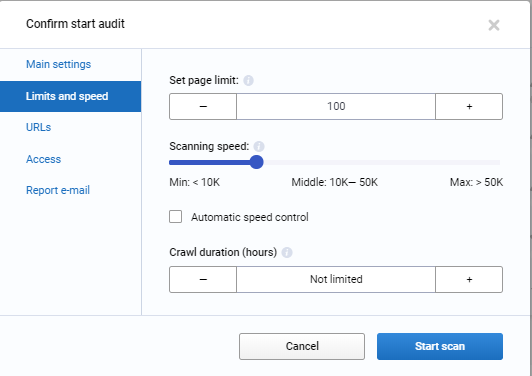 Also, you can start another site audit by clicking Repeat Analysis. High priority errors are the most dangerous and damaging for your domain SEO. Fixing those errors should be the first item on your to-do list. Middle priority errors are not so severe as the high priority ones, but still, they have a heavy negative impact on your online visibility. Low priority errors are not so undermining for the website SEO and can be sorted out after fixing the first two categories. The scheduling options are: daily, every 3 days, every 7 days or manual. By default, manual option is on. 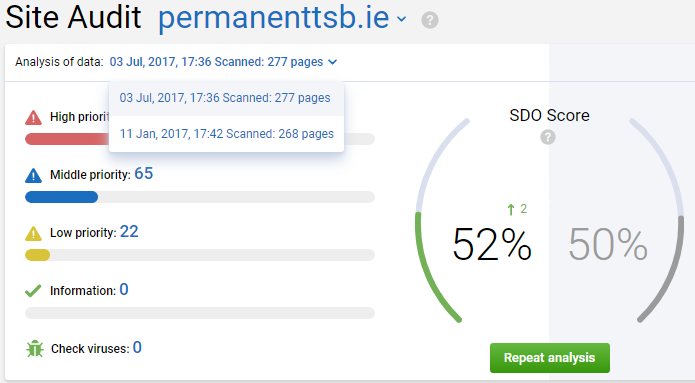 SDO Score Dynamics displays the changes in the SDO from the audits history. Serpstat Site Audit checks sites for the following errors. Pages that respond with 5xx or 4xx codes. If our crawler received of these codes from the site's hosting server, the corresponding section in the report will have a gray checkmark. To get details, expand the error report. Title is a meta tag that search engine uses to generate a SERP snippet and is important for click-through and SEO. It has to be an accurate and concise description of a page's content (up to 70 characters). Description is a meta tag that provides a concise summary of the page. Meta descriptions are commonly used on search engine result pages (SERPs) to display preview snippets for a page. Website owners and SEOs have to be careful to avoid duplicate titles or descriptions and need to adhere to the length recommendations. H1-H6 headings are used for creating page structure - they indicate the importance of page contents. H1 is the most important heading, mostly used for post titles, item names etc. H6 is the least important heading. Every page should have only one H1 heading, while each H1 heading should be unique within the site. You have to keep the valid ordering of headings. Indexation is the process of analyzing data collected by search engine crawlers from a website. The documents are later added to the search engine’s index. too little text on a page. 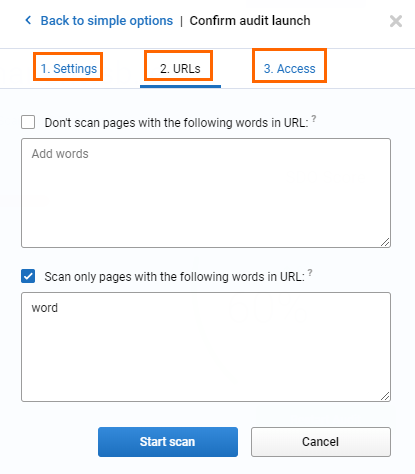 Redirection is the process of forwarding users and robots from the requested URL to other URL. It's recommended to avoid linking to the redirected page. A page should have some outbound links, however, too many outgoing links may cause page rank leakage. Audit Summary also features some charts: Crawl Depth, Redirect Types and Status Codes. Crawl Depth - the number of clicks required to access a specific page, considering the homepage as a starting point. The X-axis displays how many clicks a user needs to make to reach a page and the Y-axis shows how many pages have a particular depth level. The main page is set to 1. Redirect Type - the number of pages that have a specific redirect type. The X-axis displays how many pages have the type of redirect indicated on the Y-axis. Status Codes - the number of pages that return certain HTTP codes. The X-axis displays how many pages return the status code indicated on the Y-axis.